Repairing remote hydropower stations is a mission. The refurbishment of a large generator in the Scottish Highlands shows how Sulzer finds cost-effective solutions to extend the working life of products even in desolate places. Watch the video to see the people behind the project and learn why the service team had to refurbish the generator on-site. Surrounded by natural beauty, Lochay Power Station lies in Highland Perthshire. It’s in this landscape, near Stirling, that Sulzer refurbished one of Lochay Power Station’s generators. In spite of the logistics of moving gear to such a remote setting, the team successfully repaired the hydrogenerator. The Lochay Power Station, with a capacity of 47 MW, is part of the Breadalbane Hydro-Electric Scheme. It is operated by Scottish and Southern Energy (SSE). The Breadalbane Hydro-Electric Scheme utilizes the water stored behind 6 dams. Over 20 tunnels and aqueducts carry water to 7 power stations, of which Lochay Power Station is the largest. In 2012, SSE called in Sulzer’s Falkirk Service Center’s specialists to dismantle the generator and investigate the cause of its noise and vibrations. The stator was originally built in two halves. This unusual design was used because it was difficult to move materials to the remote location. The investigation found a gap between the core’s two halves. This had been filled with insulation, but the strip had deteriorated and clearance appeared. When the generator started up from cold, it would vibrate until it reached 50 °C. The core would expand and lock together, and the vibration cease. A cost-effective, performance-enhancing refurbishment was necessary. A hydraulic turbine converts the energy of flowing water into mechanical energy. A hydroelectric generator converts this mechanical energy into electricity. 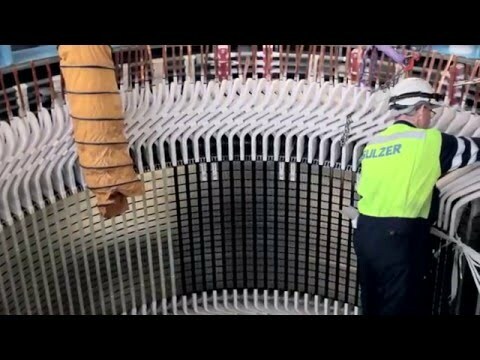 In 2015, Sulzer started to dismantle the generator and begin the rewind process. Using the on-site lifting equipment, the 56 metric ton rotor was removed to allow access to the stator and its windings, which were removed along with the stator core. The project was run by the local service center in Falkirk. It also involved skills from our other service centers, including Birmingham, where design improvements for the stator and coils were engineered and manufactured. A new one-piece core was created to replace the original two-piece design. The installation involved the construction of a ring of plates around the stator frame. This allowed 22 hydraulic jacks to be used to pressurize each core pack and to remove any air pockets. The cylinders were connected to multiport manifolds to ensure that the same pressure was applied equally around the core. Although time-consuming, it was essential that the new core’s construction was high quality. This guaranteed a reliable generator when it was returned to service. A large generator was brought to the site to test the rebuilt core. It was found to be in excellent condition. The generator was recommissioned and placed back into service. The overall output has increased by 15%, from 22 MW to 25.6 MW. The generator’s working life was extended for another 40 years. The Sulzer network drew in experienced engineers from other service centers to maintain the 24-hour schedule that was in place for a time.